The material of the bag is high quality and environmental protection burlap, can be used for a long time.Hessian has good moisture absorption and air permeability function, light weight, antimildew and insect resistant advantage.The fabric is not easy to pollute, soft colour make you relax. 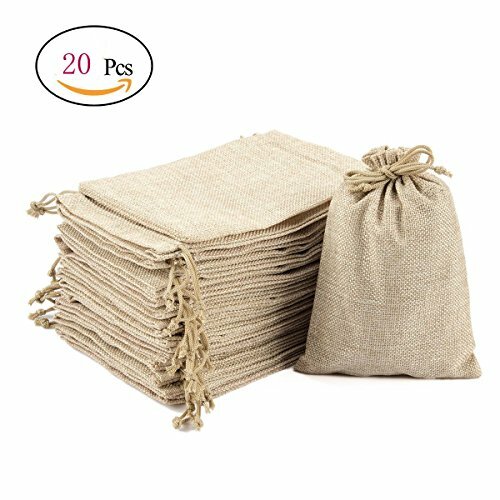 Wide Application: The natural bags befit rustic, country, beach and outdoor weddings, can be applied to store gifts, jewelries, snacks, cream jars, makeup bottle, coins, candy, wedding favors, watches,chains, bracelets, sachets, etc. Useful and Durable: The material of the bag is burlap which is durable and sturdy; They can use for a long time; Quality material and construction make them practical. Unique Design: Drawstring design make burlap sacks easier to fasten to avoid object lost; They are convenient to carry when you go out or ramble. Size :Approx:18x13cm/7x5.1inch.The dimensions below the drawstring that usable space inside is 5.5x4.9inch.Please notice the size of the bags before you purchase. If you have any questions about this product by ATROPOS, contact us by completing and submitting the form below. If you are looking for a specif part number, please include it with your message.